In 2016, the Viridian Cannabis Stock Index grew 236%, partly fueled by opportunities created by the ten new states that passed medical and adult use laws last November. 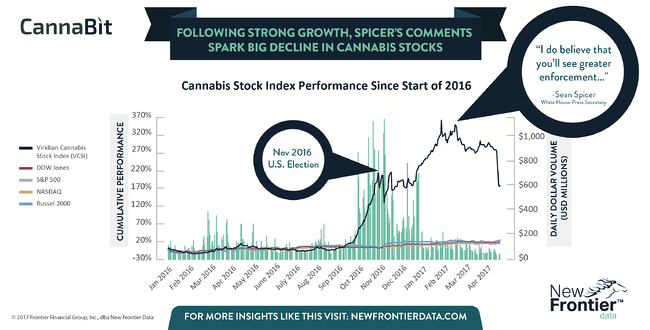 The index declined briefly after the election due to investor concerns about how the Trump Administration’s cannabis policy might be different than the Obama Administration’s. However, the market quickly recovered, and growth continued into the New Year. On February 23, 2017, White House Press Secretary Sean Spicer suggested the White House may make a distinction between medical and adult-use cannabis, signaling there might be greater enforcement of adult use laws. The statement sparked the biggest decline in the index in 18 months, wiping out almost all the gains made since the beginning of 2017. Fears of increased federal enforcement were further stoked by Attorney General Jeff Sessions’ letter to Members of Congress requesting the elimination of the Rohrabacher-Farr Amendment. This amendment prevents the Department of Justice from interfering with state medical cannabis programs and prosecuting individuals and businesses who are operating in compliances with their state’s medical cannabis laws. The Rohrabacher-Farr Amendment is up for renewal in September; this pivotal vote will influence the possibility of federal intervention in medical cannabis markets and add fuel to the ongoing debate on federalism and state’s rights in enforcing cannabis policy.